Clearly, tax incentives are necessary to motivate the public to invest in renewable energy sources. The capital expenditures for renewable energy are still high but we’re gaining ground. The following includes tax credit information for Windspire products. We’ll continue to publish information on tax incentives and rebates as we find them. Please let us know if you know of any so we can help spread the word! U.S. home owners and businesses can save 30% off the total cost of their Windspires by applying for a 30% tax credit on their federal income taxes. The credit applies to the total cost of the project, including the turbines and installation. U.S. Businesses are also eligible to take their 30% tax credit as cash. Under a new program introduced by the U.S. Treasury and Department of Energy, businesses may now collect their credit in cash within sixty days of completing an installation instead of waiting for an end of year tax credit. To learn more about the program visit the U.S. Treasury website. Local rebates are also available from state renewable energy funds and local power companies. 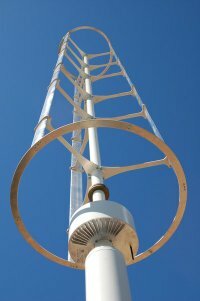 In some states the rebates can be as high as $4,800 per Windspire. Your local Windspire dealer can also help you understand your local and state rebates. You can also visit DSIRE, a comprehensive source of information on state, local, utility, and federal incentives and policies that promote renewable energy and energy efficiency.